This recipe is a Balinese version of rendang and spotlights the acclaimed trio of galangal, turmeric and ginger, that constantly feature in Indonesian cooking. It has all the virtues of a slow-cooked stew; comforting, full of flavour, tender and deeply aromatic. It is also a joy to cook as the aroma that floats around the house, while the curry is simmering in the pot, is glorious. Pound the spice paste ingredients to a smooth paste in a mortar, or blitz in a food processor with a little water if necessary to get the mixture moving. Heat the oil in a wok over medium heat and fry the spice paste for 30 seconds. Add the lemongrass, lime leaves and salam leaves and toss around for another 30 seconds, until glossy and fragrant. Pour in the coconut milk and water and bring to the boil. Reduce the heat to a simmer and continue cooking for another minute, then add the sliced beef, tamarind and palm sugar. Simmer for 2 hours, until the meat is tender and the sauce is thick and reduced. “I have been told my life is a fairy-tale but my story is simple. Born in Melbourne, Australia, I met a Balinese man from Ubud in 1984, and without much thought, moved to this charming hillside town and threw myself into a new life. Back then, ducks and cows wandered down the main road and telephones were a luxury. That was nearly 30 years ago. Hard to believe. And since that time, 4 babies have been born and businesses have blossomed. We are the proud owners of Casa Luna and Indus restaurants, and more recently, Bar Luna. I also run The Casa Luna Cooking School where happy tourists and others are taught the secrets of Balinese cooking. In 2003 my memoir/cookbook Fragrant Rice was published and is an account of my life on this fabled island interspersed with Balinese recipes and insights into local traditions. In 2004 I created the international Ubud Writers & Readers Festival in response to the 2002 Bali bombings. It has been named by Harper’s Bazaar, UK, as “one of the top Festivals in the world” and by ABC’s Asia-Pacific network as “the next Edinburgh Festival of Asia”. In 2011, my cookbook, Bali; The Food of My Island Home was released and includes my favourite recipes from Bali and beyond. I live in Ubud on the premises of the Honeymoon Guesthouse with my husband and four children, when they are all home. 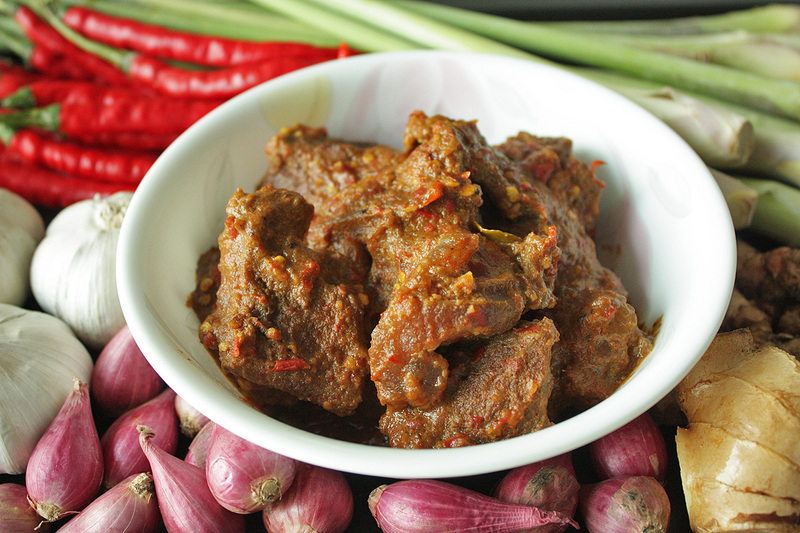 The post RECIPE OF THE WEEK – Balinese Beef Rendang – Rendang Sapi appeared first on Qraved Journal.